Free Shipping Included! CACUSS Wool Scarf for Men, Winter US Version Mens Scarf,Striped Business Collar for Autumn and Winter with Quality Gift Box, Anti-wrinkle Free, Size 70.74×12.58 Inches (Navy) by CACUSS at Cheap Work Clothes. Hurry! Limited time offer. Offer valid only while supplies last. MATERIAL AND SIZE:43% anti-pilling acrylic,30% Australian wool,20% lyocell,7% nylon,not easy to be deformed,soft long,large cozy,fluffy,light-resistant,blocking bacteria,releasing insects etc;70.74×12.58 inches. Because it is flexible, there may be some errors in the measurement. 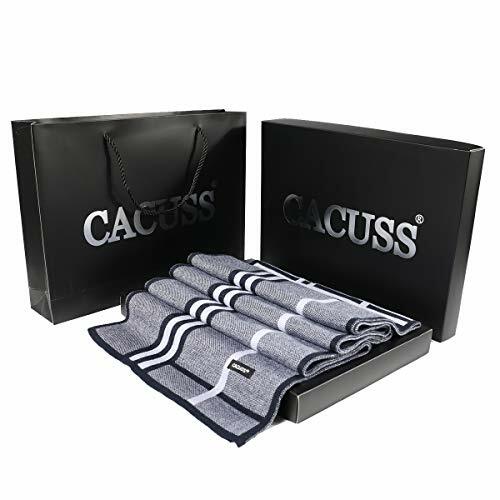 FEATURES:Woolen scarves,not easy to fading,shrinking and itching;thick and soft;Available in navy and grey;Suitable for fall and winter;High-end atmosphere gift box,can be used as a holiday and birthday gift to friends,family and lover.